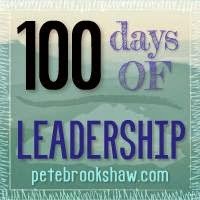 100 Days of Leadership is here. 100 leadership posts encapsulating everything leadership, from casting vision to maintaining integrity, to time management, to emotional intelligence, to leaders who have changed the world and more. Get ready for 100 days of leadership! 100 Days of Leadership – Day 1: How to become a Visionary Leader. 100 Days of Leadership – Day 2: King David: A Great Leader of his Time. 100 Days of Leadership – Day 3: The Art of Visionary Leadership. 100 Days of Leadership – Day 4: Leaders Establish A Shared Vision. 100 Days of Leadership – Day 5: Bill Hybels on Leadership: Moving from Here to There. 100 Days of Leadership – Day 11: Character vs Competence – Which do you have? 100 Days of Leadership – Day 17: What is Emotional Resilience? 100 Days of Leadership – Day 18: How do Leaders Deal with Relational Conflict? 100 Days of Leadership – Day 19: Leadership is not just about Ideas. 100 Days of Leadership – Day 20: Helpful Tips on Mentoring. 100 Days of Leadership – Day 21: Model the Way - The Leadership Challenge. 100 Days of Leadership – Day 22: You Can't Manage TIME!. 100 Days of Leadership – Day 23: Stephen Covey’s Priority Matrix. 100 Days of Leadership – Day 24: A Definition of Leadership. 100 Days of Leadership – Day 25: What is Power? Should Leaders have Power?. 100 Days of Leadership – Day 79. Sign up with your email address to receive updates straight to your inbox.